Yoga and wine events at Running Vines winery in Chesterton give participants an opportunity to wind down after their exercise class with some of the winery’s offerings. Nicole Caylor says Running Vines, the name of her Chesterton winery, is a fun play on words that captures her passions. An avid runner, Caylor says that, when she opened her winery in 2015, she really wanted to incorporate her love of fitness and running in some way with her new business. While fitness and wine might at first seem an unlikely pairing, she has found the combination to be a popular draw among fitness enthusiasts looking for a little social interaction with their exercise. Participants linger after exercising and wind down with a glass or two of wine with fellow class members. 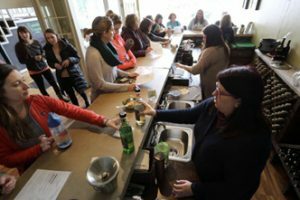 The class brings together a group of people who already share a common interest, and the setting helps participants relax and interact in what might be a new social group. Events at Running Vines are as varied as the vintages. Caylor says she has yoga and wine classes, a popular class offering that quickly fills up. The winery also has hosted running events and Bar at the Bar sessions. “They go over great. (Participants) are excited about it and ask for more,” she says. Runners always are looking for that social outlet, spawning tons of running groups and various community running events. Caylor says adding the wine component is just a way to encourage people to be more social. Caylor is not alone in seeing the appeal of combining fitness with a fun reward for participants. Fitness and alcohol pairings are on the rise and similar events are popping up around the country at places as diverse as yoga studios, gyms, brew pubs and bars. Runs and rides with a beer or wine component at the end of the event are growing in popularity and businesses are taking notice. Life Time Fitness, with headquarters in Chanhassen, Minn., and with locations in neighboring Illinois, has begun opening bars, along with other Las Vegas-style resort amenities, at a handful of its locations as the company attempts to position itself as a one-stop destination designed to draw people in and get them to stay, corporate officials said at the time of the 2017 bar opening at the Gaithersburg, Md., location. New cyclists Andrew and Sara Vaclavik of Merrillville participate in the weekly pint rides by Trek Store in Schererville to get more active and enjoy the camaraderie of the group. The Trek Store in Schererville has been tapping into people’s desire to combine their fitness routine with socialization for several years, hosting a variety of group rides, including its Tuesday night pint ride to Pokro Brewing Co. in Griffith. “Bikes and beer have gone hand in hand for years,” says Daniela Gehrls, event coordinator for the Trek Store. The store sponsors a variety of rides for all skill levels and activity goals from high-speed journeys to the weekly 12-mile pint night ride to Pokro. “Most active people enjoy something cold and refreshing afterwards,” Gehrls says. Pairing cycling with a stop at a brewery lets participants know the ride is relaxed, and it helps build a riding community. “It’s kind of fun more than anything else,” Gehrls says. When the weekly rides first started, she says, they were just meant to be a causal-paced ride to a destination. “The fact the destination ended up being a brewery was more luck than anything,” she says. The first rides partnered with Crown Brewing in Crown Point. The brewery destination just stuck. The store also has partnered with Byway Brewing in Hammond. She says riders like to mix it up, changing their routes to different destinations to keep things fresh. Like Caylor, Gehrls says the novelty of the events draw people out the first time, but the camaraderie of the weekly group get-together is what keeps them coming back, which is good for business. The ride takes about 30 minutes to the destination, a good enough amount of exercise for participants to feel like they deserve every carb they are about to intake upon their arrival. It also helps connect the individual businesses to their customers and potentially bring in new clients. Robyn Pokropinski, whose Pokro Brewing is the destination for Trek’s pint night ride, says occasionally she sees some of the faces who show up on Tuesdays back in the restaurant and brewery on nonbike-ride nights. The rides offer an opportunity to introduce the business to people who have not patronized the business before or might not have known about Pokro. “It’s a good partnership,” she says. Pokropinski said the business has taken steps to make the event more appealing to riders. A bike rack has been installed outside the front of the establishment to make it easier for participants to secure their bicycles. Pokro also offers a buffet for the pint night riders so everyone can eat and begin their return journey to the Trek Store, at the same time. 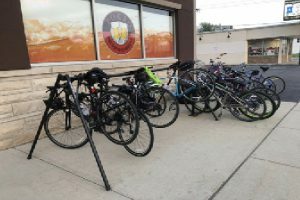 Bikes fill a rack outside Pokro Brewing Co. in Griffith during the weekly pint ride organized by the Trek Store in Schererville. The bicycling store has been combining fitness with socializing to turn up interest in its products and local food options. Marty Semrau of Dyer and his friends say they enjoy the opportunity to support local business while riding together. Semrau and his wife, Becky, are among a group of riders who have been participating in the pint night rides, among others offered by Trek, for years. The couple also goes on breakfast rides and other destination rides that bring them to various locations throughout the region. It is an opportunity to socialize with like-minded people who share a love of cycling, he says. 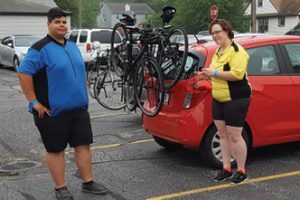 That group camaraderie brought riders out one recent Tuesday even though threats of severe thunderstorms kept the cyclists from actually riding. Participants put their bikes on their car racks and made their way to Pokro for the anticipated mid-ride beer and buffet break. “It’s the social aspect of the group,” Semrau says. Semrau and fellow riders Sharon and Karl Koch and Walter Krantz, all of St. John, agree the evening pint ride is more about being social, getting out with like-minded people and having fun doing an activity everyone in the group enjoys. “I don’t even drink,” Sharon Koch says. “But everyone here likes riding bikes,” Karl Koch chimes in. Caylor and Gehrls said events that offer a fun twist to fitness and a social outlet for participants only will continue to grow as people become more fitness and health conscious. “I think, in general, people are becoming more and more concerned with their health more now than 20 years ago and even 10 years ago,” Caylor says. Mixing running and yoga with wine tasting puts a fun spin on exercising and creates a more social atmosphere for participants. The combination also promotes a healthy balance between exercise and imbibing. “A glass of red wine is good for you, doctors are now saying. That’s what we are doing, promoting a healthy balance,” Caylor says, adding she is not advocating any medicinal benefits of alcohol just noting that many people enjoy both exercise and alcohol consumption in moderation. Gehrls says about 25 to 30 people participate in the pint night rides each week, a number she hopes will continue to grow. The thought of an icy cold pint after a warm summer night ride might be just the enticement some people need to get off the couch and ride. “The goal at the end of the day is to get people more active and kick down some of the doors people face as reasons why they wouldn’t be out riding bikes,” she says. According to the Centers for Disease Control, just 51.7 percent of adults older than 18 get the recommended amount of aerobic physical activity while an even smaller percentage, 21.7 percent, meet the guidelines for both aerobic and muscle-strengthening activity. Sara and Andrew Vaclavik of Merrillville are among those Americans who want to become more physically fit. The newlyweds bought their first bikes earlier this year after Andrew Vaclavik says he wanted to find a way to be more active in the summer. After spending a little time getting acclimated to their new bikes, the couple decided it was time to try a group ride and signed up for the pint night ride. “We tried it the first time and fell in love,” Andrew Vaclavik says. Support from veteran riders and volunteers made the newcomers feel welcome and eager to return. It also has added a level of accountability. The group notices if they do not show up and offers words of encouragement throughout the ride. The Vaclaviks have been regular participants since the ride series began for the season. “It’s great. It’s almost like date night for us,” he says. Volunteers assist with the rides, helping to ensure rider safety and also making sure riders of varying skill levels do not need to keep up with the faster riders. “It’s about continuing to ride, and it being fun,” Gehrls says. If participants are overworked their first ride, the likelihood of them returning diminishes. Andrew Vaclavik says some people have an image of a cyclist as a slender, athletic person in shiny bicycle shorts. Cycling is something anyone can do. “I’m clearly not like that,” he says, adding that his inexperience has not stopped him from riding or lessened the support he receives from more seasoned fellow riders in the group. It is the support and sense of community that keep the couple coming back. “It’s more about riding and getting to know people,” he says.